After an opening year or so in which, a couple of GABS and Good Beer Week brews apart, Hawkers Beer had been doing little other than try to keep pace with the rapidly growing demand for its four core beers – Pale, IPA, Saison and Pilsner – the Reservoir brewery released its first seasonal in June. The Imperial Stout was a finely crafted and very traditionally minded take on the style; a balanced affair that paid tribute to the English originals. At the same time that they packaged said beer, they squirrelled some away into bourbon barrels they'd secured from Wild Turkey and Heaven Hill in the States. And now those barrels have been blended to create this rather more contemporary, barrel-aged take on the style. Just as the original Imperial Stout had opened up and gained in character between our first sample from the bottling line and its formal release weeks later, here things step up in intensity again. It's an utterly black beer – no light is penetrating this black hole – and one that has gained in magnitude, sweetness, viscosity and, not least, booze, rising from a straight 10 to 12.2 percent ABV. 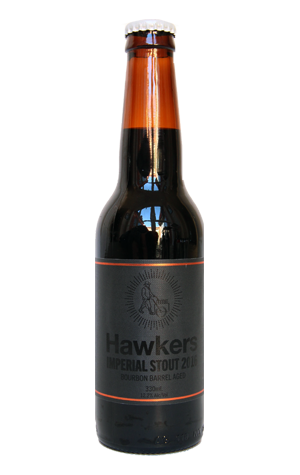 Yet, despite its beastly size, it retains the key quality for which Hawkers is becoming known: balance, in this case between roast malt, oak, rich chocolate, vanilla and sweet alcohol components.